Ahh-Some does the job in 24 minutes! NOT 24 hours! For water that is clean and crystal clear! Ahh-Some Gel is a unique blend of next generation cleaners that work diligently to remove organics and particulates from surfaces and plumbing infrastructures that may cause unsightly and problematic situations. Adding them to your regular maintenance will provide water that is cleaner, clearer, and more satisfying to your skin. You may also benefit from using less chemicals in your hot tub. Reduce your sanitizer levels as the build- up for organics will be dramatically reduced. Greatly improve your water clarity, aroma and feel. Increase the enjoyment of your “soaking experience” as your skin will feel soft and silky smooth. How does Ahh-Some Help Eliminate The Biofilm? Ahh-Some works at dislodging the Biofilm EPS matrix. (EPS are mainly polysaccharides, proteins, nucleic acids and lipids; they provide the mechanical stability of biofilms, mediate their adhesion to surfaces and form a cohesive, three-dimensional polymer network that interconnects and transiently immobilizes biofilm cells.) Our formulations include components that soften the outer walls of the bacteria, allowing scrubbers and carrier salts to loosen and break-up these hard to get rid of pathogens. It effectively does this by stripping the layers off the biofilm when it is adhered to a surface. Ahh-Some will NOT harm o’rings, seals, or existing plumbing. It is totally NON-ACIDIC. You must remember that Ahh-Some is not an enzymatic cleaner so when using this product in sanitized systems, add a shock dose of the sanitizer during treatment. This ensures that the Ahh-Some dislodges cells back into planktonic condition, your sanitizer can attack and control as it was designed. Don’t Sanitizers Kill All The Bacteria? Spa must be full of water prior to adding Ahh-Some. Add a full level teaspoon of the cleaner per 400 litres of water. Remove Filter(s) and Place in Hot Tub.Turn on the pump so the jets are operating. In minutes the water will become a little foamy. This is normal. Keep the jets on for 5-10 minutes when you clean the tub for the first time. You will now see a brown and black froth appear on the water foam surface. This is the gunk coming out of the plumbing surfaces and the gunk on the tub shell. Take Filter(s) out and Spray clean. Now, simply drain the discolored water from the hot tub. Rinse off the shell and then wipe with a clean cloth. 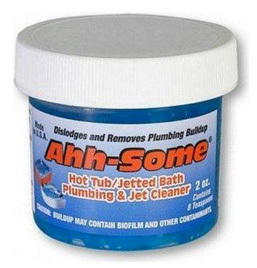 Note that Ahh-Some is for purging only, not to be used as a hot tub chemical. Ahh-Some is for getting the rest of the gunk out of the spa and pipes before a water change for clean water. Want to use less sanitizer in your spa? 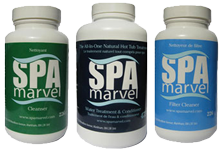 Spa Marvel enhances chemical treatment by supporting water balance. This allows for less chemical wear and tear on lids, jets and equipment, resulting in a longer spa life.